You can book ferries from Bali to Lembongan, Lombok, Gili Air and Gili Trawangan with AFerry. See the departure boards below for the latest schedules and use the booking form on the left to book your Bali ferry with AFerry. Bali is part of the Lesser Sunda Islands located in the South-central part of the Malay Archipelago, between the islands of Java and Lombok. Near to the equator, this is one of the most complex regions and with more volcanic activity in the world. The highest point of the island is Mount Agung with more than 3.000 m high. The island is surrounded by coral reefs, the ideal place for lovers of scuba diving. Anecdotally the beaches in the South have white sand while those in the North have black sand. It has a tropical climate, with a rainy season from October to March and a dry season from June to September. During the day the average temperature is 20 to 33°C. The island is a popular tourist destination and is known for its dance, sculpture, painting, jewelry, furriery and music. Serangan terminal is located in the southern part of the island (south of Denpasar) approximately 20 minutes from the popular tourist destinations Kuta, Legian, Seminayek, Jimbaran and Nusa Dua. The ferries services go to the islands of Lombok /Teluk Kode and Gili Trawangan. Sanur Jetty terminal lies to the east of Denpasar on the south - east coast of the island. The ferry services go to the islands of Lembongan and Lombok /Senggigi Harbour. Padang Bay terminal is located in the Central - eastern coast of the island near Candidasa. The ferries go to the islands of Gili Trawangan and Lombok /Teluk Kode. The most popular method of transportation on the island are the mopeds. Bali is a popular tourist destination known for its beaches, coral reefs, green volcanic mountains, rice paddies and meditation retreats. 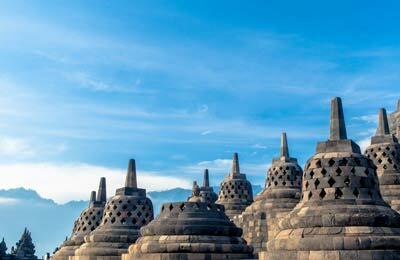 Popular tourist resorts include Nusa Dua, Seminyak and Sanur. Bali's capital Denpasar, is located in the southern part of the island. 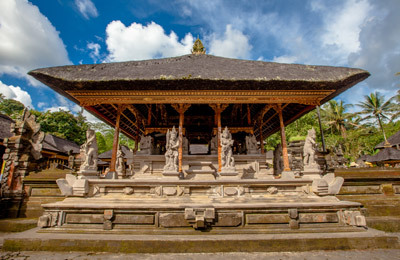 Bali has a rich history with popular sites such as Uluwatu Temple, The Mother Temple of Besakih and Pura Bratan.